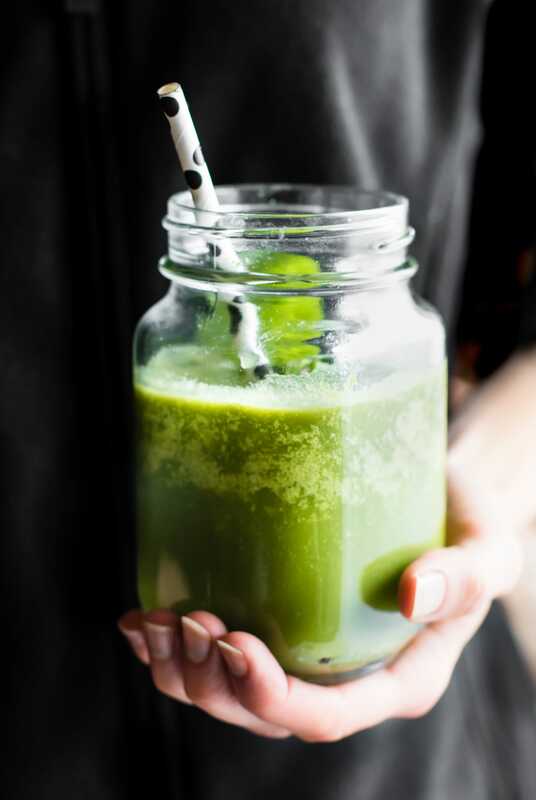 A POWER FUEL Green Smoothie to kick start the day . 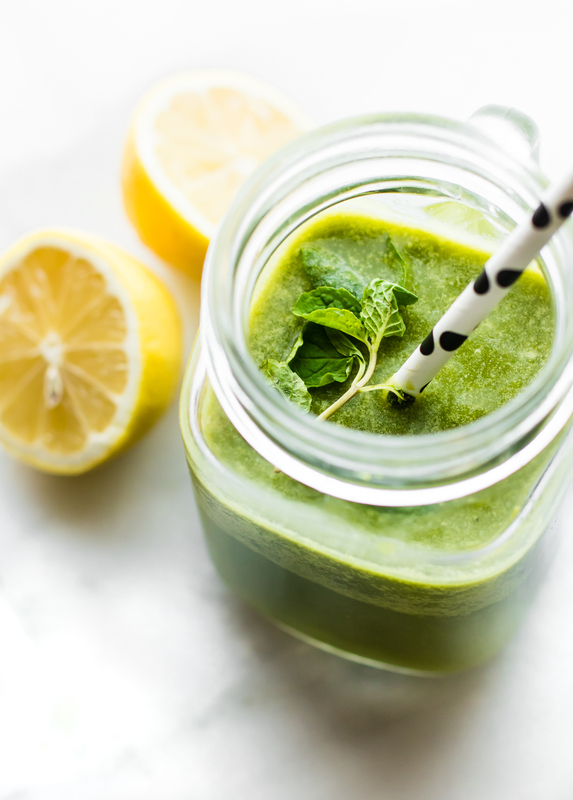 This green smoothie is powered by real food. Jammed packed with super food nutrients that work in synergy to BOOST energy!. Easy (easier) to digest. Paleo, vegan, and whole 30 friendly Find out more about how these superfoods work in synergy below! As I sit here writing this post. A post about needing ALL the fuel and green smoothies, it’s currently white outside. Meaning, a white out. Snow. 30F. Which is why sharing a green smoothie recipe seems wrong (because it’s cold) but oh so right (a much needed immunity boost). 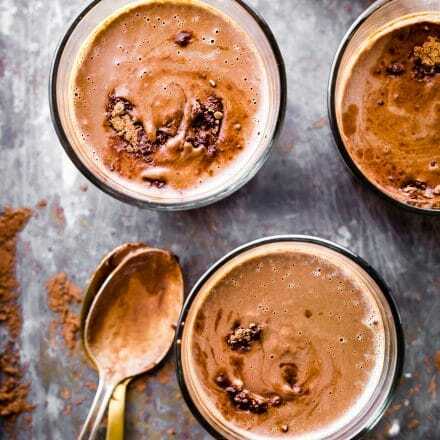 Winter months can be draining, our bodies need extra fuel and nutrients to brave the cold. And sometimes, okay a lot of times, we find it hard to jam pack 4 bajillion different kinds of fruits, veggies, healing herbs, and anti-inflammatory spices into one day. At least I do. Sheesh, my poor gut can only can handle so much fiber, especially after colon surgery. That’s a story for another day, or maybe not a story to share at all. Haha! You get my point. But the truth is we ALL need power nutrients to “fuel” our diet. Whether is be for gut healing, for energy, for combatting sickness, for post workout recovery, or for just for overall wellness. Power Fuel Green Smoothie to the rescue. Yep. Jammed packed with power nutrients. Super greens. Easy (easier) to digest. Paleo, vegan, and healthy on steroids. Nutrition nerd cap goes on. 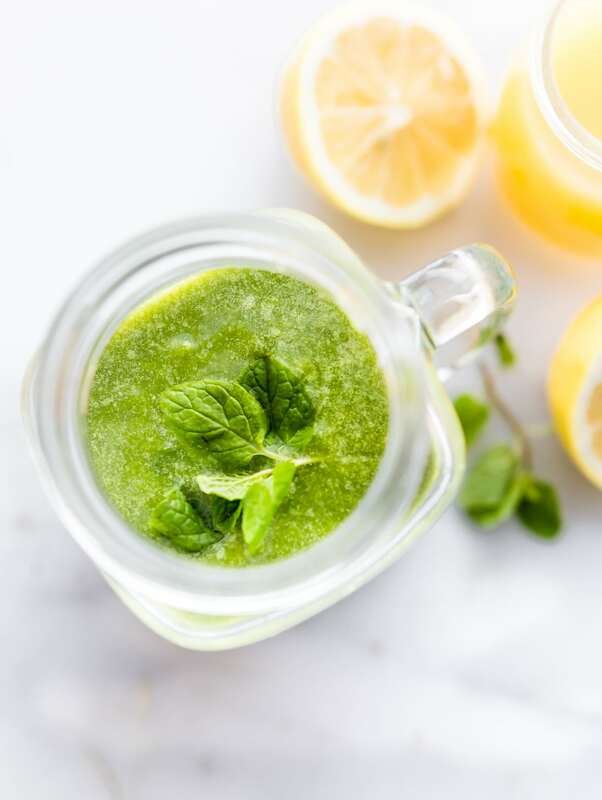 This Power Fuel Green Smoothie Recipe is made of up green apples, lemon, coconut oil, steamed spinach (slightly steamed), mint, and orange juice. Here’s how they work together to create SNERGY POWER FUEL!! When you combine Vitamin C rich foods (Orange Juice, Lemon, Apple) with plant based Iron (spinach), you get better Iron absorption. 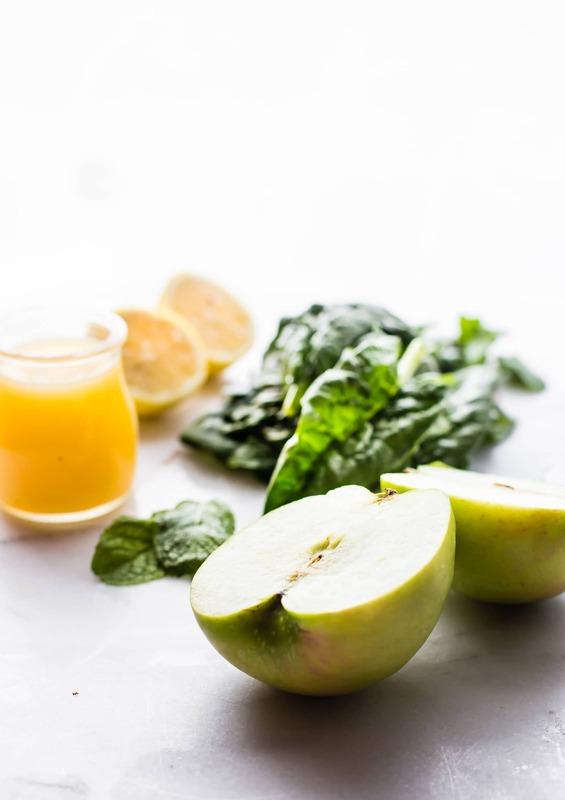 Adding the powerful antioxidant Quercetin (which is in apples) to your diet can help Quercetin can help stop inflammation. This anti-oxidant so powerful it can also help reduce chronic fatigue. (source). Why I love my Quercetin Packed Smoothies! 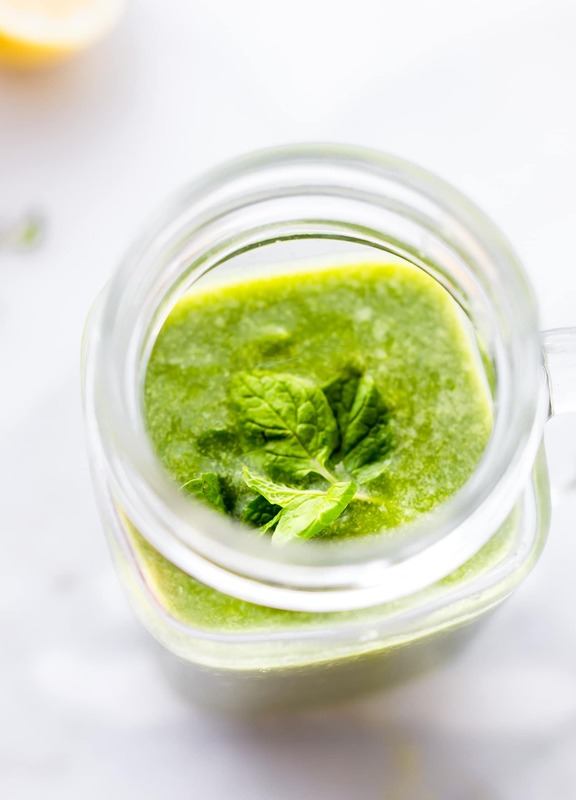 Mint Leaves – Soothing herb to help ease digestion but also open up airways for better respiration. Mint contains menthol, a natural aromatic decongestant that helps to break up phlegm. I just said phlegm in a recipe. Ooops! Haha, either way, get those lungs ready to POWER up! When you slightly steam your spinach leaves you are able to digest your food better, without discomfort. Ya, you know how raw spinach can be. EEK! And lastly, adding in a healthy saturated fat, such as coconut oil, can not only increase your iron absorption when paired with Iron rich foods, but it can also naturally BOOST energy, and quick! You see, coconut oil contains Medium Chain Triglycerides (MCTs), these are medium Chain Fatty acids. MCT’s are metabolized quicker. They are first absorbed into the blood stream but then bypass digestion process and go straight to liver, which then turns them into ENERGY. Unlike other Long Chain Fatty Acids. 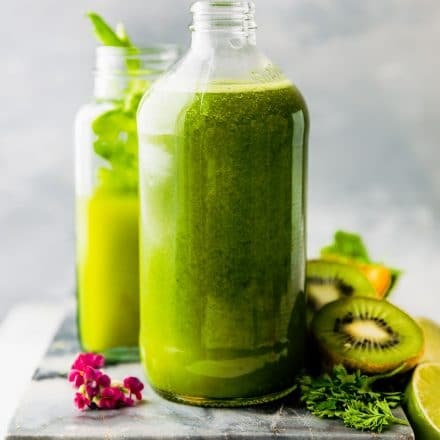 Quick POWER FUEL green smoothie energy! Gotta love that type of fat, yes? AMEN AMEN! Are you still with me? LOL! I hope so. That was a lot for a Monday. But you see, I just had to explain my reasoning behind this green smoothie. It’s unique. It’s powerful. It’s why I love doing what i do. Taking real food and using it as FUEL, oh but fuel that tastes, well…. TASTY! 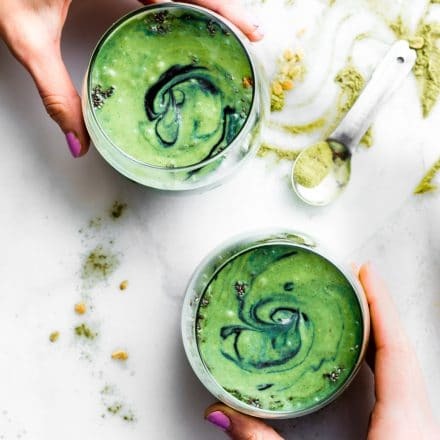 This power fuel green smoothie is on our weekly rotation. Especially now that we have moved to Utah. The kiwi and I made a goal we’d try new outdoor adventures together. Um, like snow shoeing and cross country skiing. So I’m gonna need all the fuel I can get. Like stat! Haha! POWER FUEL Green Smoothie. 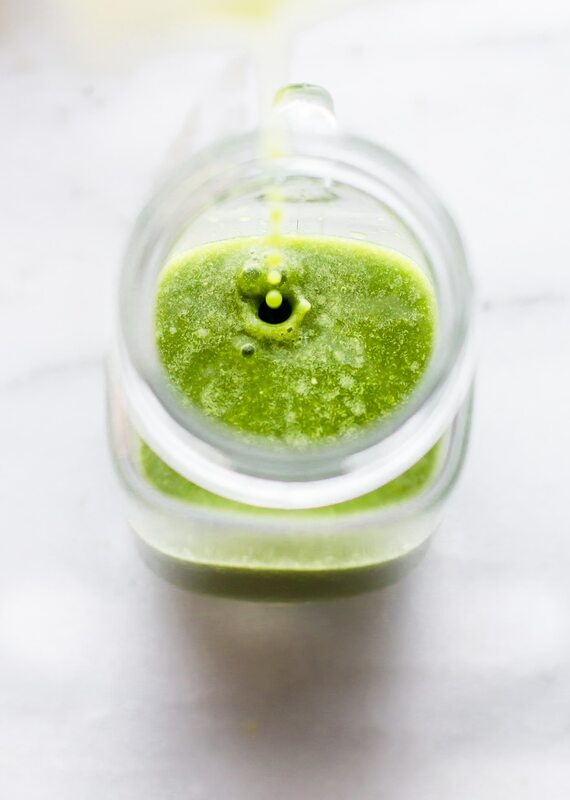 The perfect green smoothie that’s powered by real food. Whole 30 friendly, Paleo, Vegan. optional sweetener (see notes.) omit if Whole30. First place your spinach leaves in microwave safe bowl. Add the coconut oil. Mix together. Steam in microwave for just 15-20 seconds. You can do this on the stove as well. Just make sure the spinach is slightly steamed and mixed with oil. Next place the remainder of your ingredients (apples, juice, mint, etc.) in a blender. Add your coconut oil and spinach. Feel free to add more juice or water to thin it out or a handful of ice to thicken it. If you want it sweeter, add 1 small banana or maple syrup. Optional Sweeteners – 1 tbsp or more maple syrup, honey, coconut sugar, a few pitted dates, or even a banana. Cheers to lean mean green power fuel machines! I mean smoothies. What do you put in your winter smoothie? Green Smoothie? All of the above? I gotta know. I’m nosy like that. Haha love the nutrition talk. Hope you stay warm! I thought I was cold at 59! I’m warm. 59F would be hot to me now ? I’m guessing your nutrition nerd cap is green? With the apple, orange, and mint, I bet this does taste delicious! Who knew green fuel could be so pretty?! My dog is adjusting White stuff too! It’s like powder here now! So fun! For sure! Coconut oil for the win ?? Girl, I can’t believe you’re drinking smoothies these days . . . but it looks and sounds fantastic! I swear it’s not that cold. I’m at st elevation. It’s nice and dry. Yay! I’ve been craving greens lately… I think all the holiday celebration finally wore me down. HA! I can testify to the fact that smoothies give SO MUCH energy especially when you’re dragging, and they can really fill you up. I love that you put on your nutrition nerd cap every time, because I learn something from you every time about food and the wonders that God has put into it. It sings His mighty glory and wonder! That is just so cool that combining Vitamin C rich foods can make for better iron absorption! I agree. God made our food so purposeful! I’ve been enjoying your IG stories – from the comfort of my warm house! Wow – you aren’t kidding – y’all sure are surrounded by the “s” word! Lindsay, I gotta say, I <3 smoothies like this that help up your energy and immunity too! Stay warm, my friend! smoothies and snow and salt lake! LOL! yes! I should whirl up some spinach and coconut oil and butter in a blender with some sweetener and see what happens. Could be a mess. Could be a huge win. We shall see. WE shall see! oh no! so sorry to hear. YOu all better now? the flu is the worst! You know you can allllllways count me in for one of these, right? No matter how cold it is outside!! It sounds like you’ve been embracing the outdoors in your new home and I’m so glad to hear it’s going well! 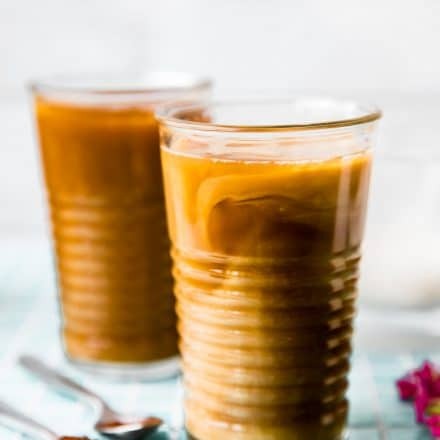 I’m sure winter doesn’t feel like the ideal time to move, but just think about how you’ll be all settled in by the time the nice weather rolls around… then you’ll get to explore your beautiful new surroundings, ideally with a smoothie in hand. 🙂 PS. Coconut oil for the win! totally! you’re my green goddess smoothie queen! ps I miss you! How are you? Dark photography seems to be all the rage these days, although I’m a fan of bright and colorful, which is why your light, vivid and airy pictures always make me happy. 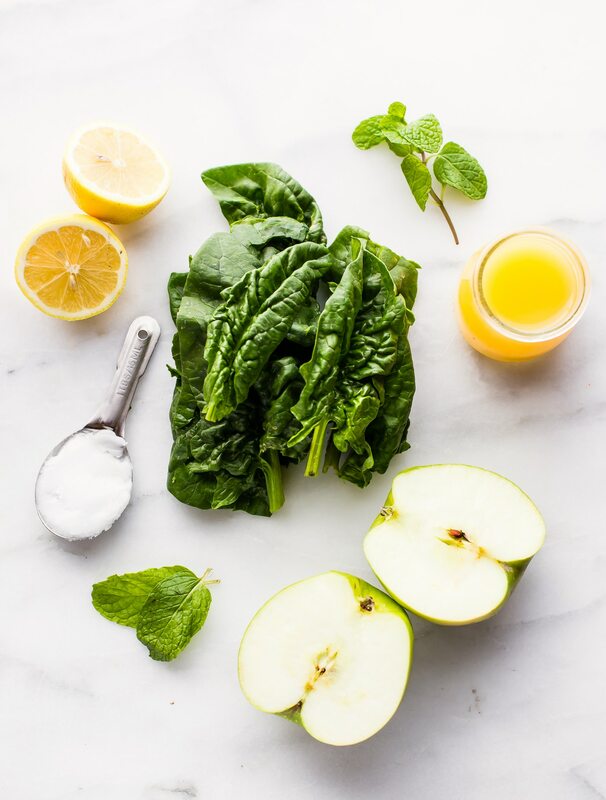 Bring on the green juice. thank you friend. I tried dark photos.. failed. I like dark/bright. if that makes sense? I cannot tolerate the taste of mint, but love basil. 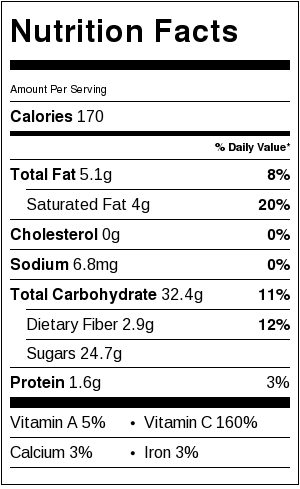 How do the two compare nutrition wise? both are great! Basil is more of an anti-microbial,anti-bacterial. Great for immunity and fighting stress/inflammation . Mint is similar but also more soothing for the body, digestion, etc. This looks delicious and super healthy! What is the purpose though of melting the coconut oil? Is it possible to use something other then orange juice. I am allergic to oranges. Sure! Maybe try apple (no sugar added), pineapple, or grapefruit! Thanks, I think grapefruit might be a great alternative. Whenever I make this… My body is thanking you <3 Awesome recipe, Lindsay! I was pleasantly pleased with this drink, it was very easy to put together. I’m hooked!! Wonderful! Thanks for the feedback Joanne! I made this today and it was delicious!! Do you think it would keep well if you meal prepped a big batch of it for the week?? Totally! SHould be good for 2 days or so. Just be sure to get the freshest greens.